A while back, Russ reviewed the Candy Cane Joe Joe’s. Those things are so popular, they have their own Facebook fan page with nearly 2,000 followers! Russ wasn’t quite as enthused with them as some people seem to be, but they got an OK score from WG@TJs. And a long, long time ago, I reviewed the Joe Joe’s n’ Cream Ice Cream. Pretty good. 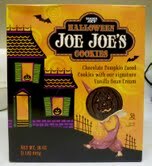 I’ve heard a bit of online chatter about these Halloween Joe Joe’s, available only seasonally, and they’re apparently a pretty big hit, as well. It’s kind of a holiday theme I see here: sandwich cookies with candy canes at Christmas, Jack-o-Lantern face cookies for Halloween (or should I say “Joe-o-Lantern,” haha), and then who can forget the Thanksgiving Joe Joe’s with cranberry sauce filling or the New Year’s Joe Joe’s: two thin chocolate cookies with layers of pork and sauerkraut in between. Yummy. Actually, those last two types of Joe Joe’s don’t really exist, at least not to the best of my knowledge. But my point is that there’s a whole line of Joe Joe’s products, including a few seasonal items that people wait eagerly for each year. Now, I wasn't as courteous as Russ with this post, because I didn't think to take a picture of the nutrition information before I threw away the box. I will attempt to remember to do so in the future, as our readers have asked for that. And it's just one more practical way we can help people plan their weekly grocery store trips. For these cookies, I'm going to go out on a limb and tell you that these are not low fat, low calorie, or low anything. These cookies are full-on dessert items. Hopefully Trader Joe's used real sugar and other natural sweeteners like they usually do instead of something out of a test tube, but other than that, there's probably not a whole lot that was spared to make these a sweet treat type of food, as opposed to a lite, healthy snack. As far as taste, well, they're chocolate sandwich cookies with vanilla filling. Very sweet. They seemed sweeter than most to me. And I have a sweet tooth. Sonia, who claims to like sweets less than I do, says that they were the perfect sweetness and better than Oreos. That's a bold statement. I don’t know if I can agree with that statement totally, but I will give them this: their “vanilla bean cream” filling actually tastes like vanilla bean…very natural—super sweet—but certainly not fake. I guess it might be better than the filling in an Oreo. And let’s face it, the filling is the best part. I thought the chocolate part of the cookies was pretty standard. I don’t know what else to say about them, except maybe that they’re cute. Yeah, everything from the packaging, to the orange-colored filling, to the aforementioned “Joe-o-Lantern” face on them is remarkably well-designed and season-appropriate. Props to the designers. Maybe in part because she's a graphic designer and has an affinity for cute things (such as myself), Sonia’s gonna give ‘em a 4. She’s a fan. They’re good…but there was something about them that made me feel like I had eaten too much after eating only about three. And that doesn’t happen to me very often. If not for the ounce of self-control I was blessed with, I could generally down an entire package of cookies like these before getting that “Oh, maybe I should stop eating” feeling. So I’ll give ‘em a 3. Thanks for all your comments! Yeah, we could never see ourselves living outside of TJ's territory either, Jess! We are Oreo Peeps but We love these Cookies, We have had like 4 boxes already. I had to quit buying them cause our daughter would eat them for every meal if we let her. They are a little sweet but paired with milk are good for dunking. Thanks for sharing your thoughts there have been a few things I normally overlook at TJ's that I have tried thanks to your posts.